This is a somewhat unusual Cool Technology entry. Last night, three bloggers - Paul Levy , Jessica Lipnack , and I were invited to attend a performance of Shakespeare's Julius Caesar at the American Repertory Theatre (ART) in Cambridge, Massachusetts. Paul wrote about the leadership lessons learned from the play's theme and dialog. Jessica wrote about the network of people who made the ART production happen. This leaves me to talk about the engineering behind this Avant-garde production. The scenery was pure 1960's, reflecting the surroundings of the Loeb Theater, which was built in 1964. The set included two-tone leather couches and a dinette complete with moon chairs. The backdrop mirrored the banked seats of the theater, blurring the distinction between stage and audience. The set changes included dynamic transitions of the background, with curtains falling into place to create the perfect 1960's pied de terre, right out of an Austin Powers film. Just how do curtains, walls, lights, microphones, and furniture move around during productions like Julius Caesar? The answer is a theatrical fly system. A fly system is a collection of ropes, counterweights, pulleys, and other such tools within a theater designed to quickly move objects on and off stage by 'flying' them in from the area above the stage, known a flyspace, flyloft, fly tower, or fly gallery. In this case, the entire theater backdrop rose and fell, and walls of curtains were raised and lowered as needed to create different room views. To think that all these seamless movements were accomplished with ropes and pulleys is pretty cool. Another interesting technology was used to create the Quentin Tarantino-like spattering of blood as Julius was asssasinated and the conspirators covered their hands in his blood. Just how does Hollywood (or Shakespearan theater) create the illusion of injury and bleeding? They use a technology called Blood Squibs . Balloons filled with blood are exploded using small electrically activated explosives. The conspirators in Julius Caesar eventually meet their own bloody ends and the production did a remarkable job with creating subtle but sanguine changes in clothing throughout the final act using blood squibs. 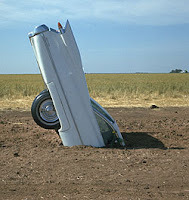 In the final act of the play, an entire Cadillac limousine is lowered from the ceiling, in homage to the 1960's era Ant Farm performance art installation of the Cadillac Ranch , an artwork which included several images of JFK. The juxaposition of 1960's era Kennedy themes with the assassination of Julius Caesar was striking. Just how does a theater raise and lower a Cadillac limousine from the ceiling? The answer is 4 one ton winches mounted in the ceiling. Theatrical flies, blood squibs, and high powered winches - cool technologies when "The play's the thing!" Thank you for joining us for Julius Caesar. It was a pleasure meeting you. It's always great to see someone as excited and curious about what happens on the stage (technology-wise) as I am. Our production staff is simply outstanding.